We LOVE quesadillas. 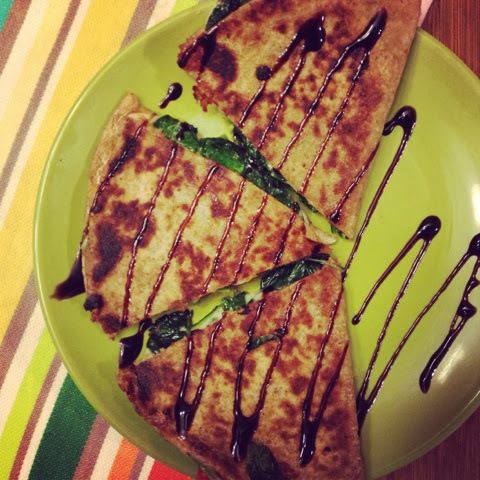 Who says all quesadillas have to be packed with Mexican flair? As much as we obsess over Mexican food, today we are whipping up a quesadilla, Italian style! Today's lunch will come together in under ten minutes and is made from only 6 ingredients! Can you beat that?? To start off we simply sauté up fresh spinach with chopped garlic. Now that the hard parts over ;) we will begin to stuff. We cheated and used jarred roasted red peppers, but feel free to get fancy and roast your own if you want! 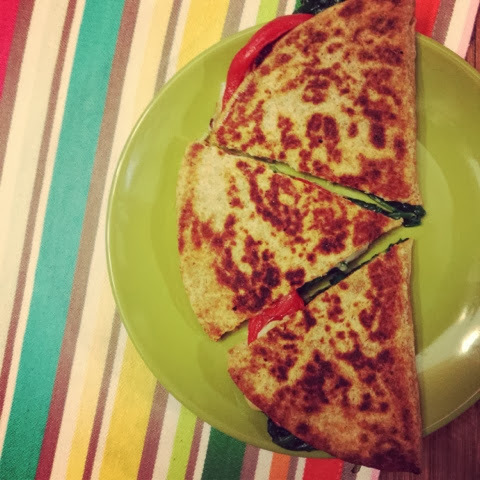 To assemble stuff each quesadilla with 2 tablespoons of reduced fat mozzarella cheese, sautéed spinach, roasted red peppers, and balsamic vinegar! That's it! 1. Spray skillet with non-stick spray over medium heat. Add garlic and spinach to pan. Cook for 2-3 minutes or until spinach wilts. Set spinach aside. 2. Begin to assemble quesadillas. 3. Lay out tortilla on flat surface. Add 1 tbsp. cheese to right side of tortilla. Layer on garlic spinach and roasted red pepper slices. Top with 1 tbsp. cheese and 1 tbsp. balsamic vinegar. Fold over tortilla and continue to assemble the rest. 4. Add non-stick spray to same skillet you have been using. Add two folded quesadillas to pan. Cook each tortilla for 2 minutes per side. Continue cooking 2 at a time. 5. Slice each quesadilla into 3 slices and enjoy! I just made this for lunch for my family, we loved them!!! Delicioso!